Premium direct daughter of the legendary jumper producer Rebel Z and full brother to the mare Ratina Z who won the Gold Medal at both the Barcelona and Atlanta Olympics, the 1994 World Equestrian Games and the European CHampionships. Probably the best showjumper of all time. Rebel Z himself jumped internationally and was the foundation of the Zangersheide breeding program. Dam Ultra B is a premium daughter of the great Acorado out of a states premium Capitol I -Landgraf mare from the stamm 317 A. This filly is jumping royalty at its best. Lovely, kind mare under saddle. 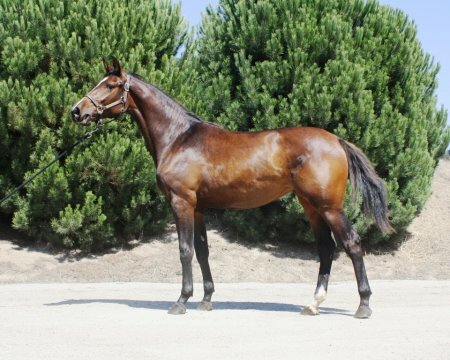 Premium direct daughter of the legendary jumper producer Rebel Z and full brother to the mare Ratina Z who won the Gold Medal at both the Barcelona and Atlanta Olympics, the 1994 World Equestrian Games and the European CHampionships. Probably the best showjumper of all time. Rebel Z himself jumped internationally and was the foundation of the Zangersheide breeding program. Dam Ultra B is a premium daughter of the great Acorado out of a states premium Capitol I -Landgraf mare from the stamm 317 A. This filly is jumping royalty at its best. Lovely kind mare going well under saddle and jumping small courses.